One of the many features included in OS X Lion was a set of application enhancements, such as a full-screen view with multitouch What You Need To Know About Touchpads Before Buying Your Next Laptop [Technology Explained] What You Need To Know About Touchpads Before Buying Your Next Laptop [Technology Explained] If you walk into a retail store and ask a sales rep to explain a laptop to you, chances are you’ll receive a long list of hardware information focusing on what’s inside. This is information... Read More gesture support, enhanced auto-saving, and more. The new features are only available in apps updated to support them however, and Apple is now highlighting software updated for Lion in the app store. The list stands at just 48 apps, which seems a bit small compared to the hundreds found in the app store. That number includes a handful of apps developed by Apple itself, such as Pages and iMovie. Only four apps on the list are free Top 20 Free Apps for Your New iPad Top 20 Free Apps for Your New iPad Read More , and most are $9.99 or above, so bargain shoppers will be disappointed. To be fair, developers have had barely more than a month to implement support for Lion’s new features, a time-frame that is tight even by the standards of experienced professional developers. Smaller developers offering inexpensive or free apps will require more time to make their software compatible. Apple made no announcement to coincide with this new section of the app store, and hasn’t provided any information about how long it might last. The apps listed are only given special placement, not special pricing, so there’s no need to act fast. 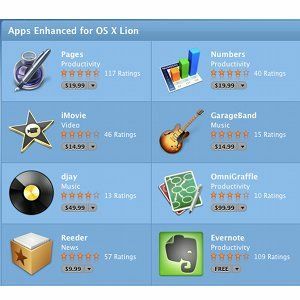 Explore more about: Mac App Store, OS X Mountain Lion. Is there any way I can exclude everything apple from my feed?